Not Yukio Mishima's masterpiece of two lovers who found happiness by the sea, but an equally fulfilling — and more fundamental — tale: how to love oneself. Apropos of choosing to be driftwood, some call this a graveyard (for dreams), I call it a harbor. 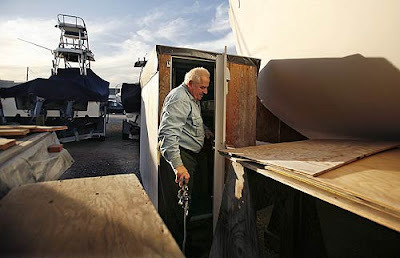 Markvart, along with a few other regulars, reports to his boat every morning at the Boatyard Storage lot where his decades-long labor of love will some day take float. “It’s like building Mt. Rushmore. It takes a lifetime to finish it," he said. On dry land near Newport Bay, they toil for years to finish their boats, dreaming of a life afloat and knowing that it may never be. Like the other old men at this Costa Mesa boatyard, where the hulls of peeling sloops and half-made cutters rot on their wooden posts, Karl Markvart can't be certain he'll live long enough to reach the water. Again and again, he's watched the boat builders around him lose their race to the sea, their unfinished vessels hauled off to the junkyard to make room for another boat, another mad dreamer. 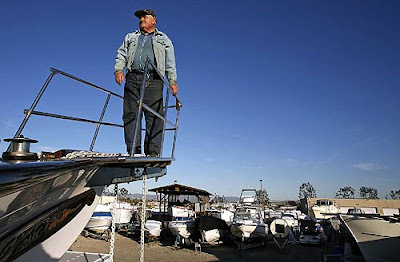 Karl Markvart stands on the bow of a friend's boat at the Boatyard Storage in Costa Mesa where the two men are building the home of their dreams. Markvart, 69, has been piecing his 32-foot Dreadnaught cutter together for more than three decades. At 69, Markvart knows it's dangerous to dwell on the size of the task before him, all the work that remains on the 32-foot Dreadnought cutter that is now his home and that he expects, with luck, will one day be his tomb. 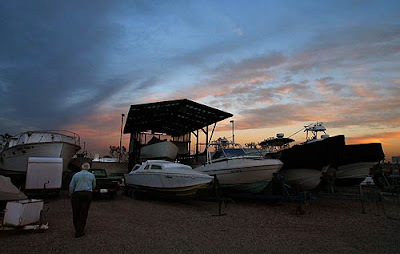 He's one of the few regulars at the Boatyard Storage, which sits two miles from the nearest harbor. Piece by piece, Markvart has been building his cutter since buying the fiberglass shell for $9,000 34 years ago, but the boat has been with him — shimmering in his imagination — for nearly twice that long. As a boy in Prague who'd never seen the sea, he found an adventure book in his tiny neighborhood library. It told of two kids who slip their parents and brave the wild oceans on a sailboat named Little Cloud. The accompanying illustration showed a boat with a single mast, three sails, and a stern nearly identical to the bow. He memorized the picture and the names of the parts. 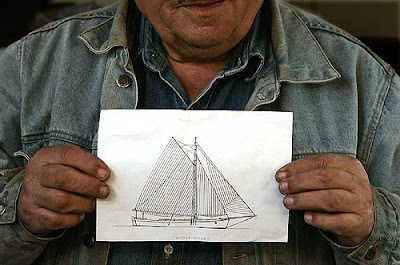 Markvart holds a drawing of "Little Cloud," the boat that inspired his dream of sailing as a boy in Prague. Though he would later forget the book's name, he memorized the picture and the names of the parts. Long after he forgot the book's name, it scudded through his dreams, that magical boat, begging to be built. "From 10 years old," says Markvart, whose English is broken, "I had a sailboat back of my head." Since then, he's sailed in the Adriatic and the Mediterranean and the Pacific, but never on his own craft. Markvart takes a break in the workshop area beneath the hull of his boat. He’s sailed the Adriatic, the Mediterranean and the Pacific -- though never in a vessel of his own. Behind the boatyard's barbed wire fence, set back from Placentia Avenue in a nondescript industrial area, Markvart's boat, a single-mast, double-ender modeled after the classic shape in the picture, is inching toward completion. 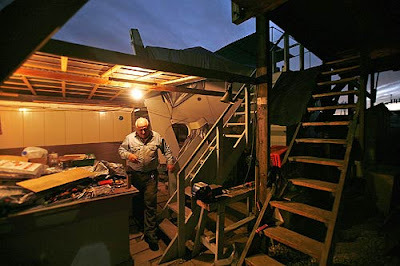 Every morning, he descends the 12 wooden steps from his boat's deck to his workstation below, where the ground is littered with fine metal scraps and shavings. There, using surplus metal foraged from machine shops, he builds the boat's hundreds of metal fittings, including the complicated stainless-steel blocks that will adjust the sails. He cuts the metal sheets with a hacksaw, drills them in a 25-year-old press, smooths them and stamps them with his initials. 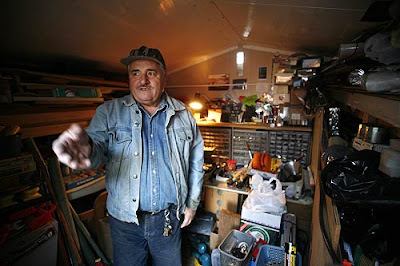 Markvart emerges from a shed he uses to store the handmade parts he crafts for his boat. “When you are an old man in rough seas, alone, you have to have everything well-made,” says the retired aerospace engineer. "When you are an old man in rough seas, alone, you have to have everything well-made," says Markvart, a stout, round-faced man with thinning white hair, a slight stoop and an ironworker's thick, strong hands. "You cannot go to the store and buy fittings like I'm making. It's junk, and high price tag." 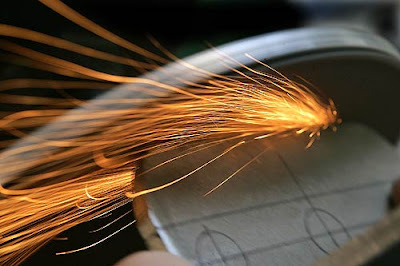 A piece of metal is ground and smoothed in Markvart's workstation. He uses surplus material foraged from machine shops to build the boat’s hundreds of metal fittings. 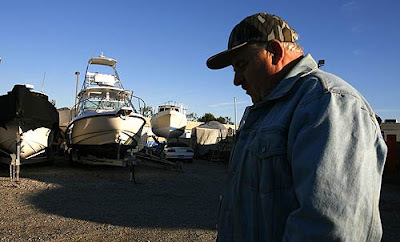 Markvart, a retired aerospace engineer, makes his $320 rent at the boatyard with Social Security and a little savings. In the boat's galley, he cooks cheap, simple meals of potatoes or pilaf, and a boatyard neighbor lets him visit his nearby house for a shower when he needs one. While others work from blueprints, Markvart's finished boat exists only in his head. He's already completed many of the big jobs, like laying 7,000 pounds of lead and rebar ballast into the keel. 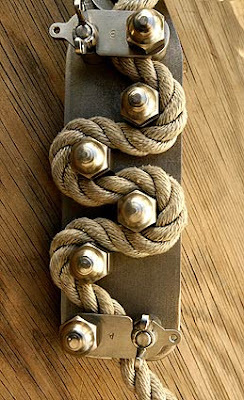 This handmade device will grab the anchor rope on the bow on Markvart's craft. "It's like building Mt. Rushmore," Markvart says. "It takes a lifetime to finish it." The circulation in his left leg is bad, but if his strength keeps up, Markvart figures he can launch in three years. He'll head to San Francisco Bay, to Oregon, then up to Alaska and British Columbia, and then who knows? He'll make salmon fillets, adjust his sails, listen to the BBC on his shortwave, and try to stay awake through the night, to steer clear of the big boats that can't see him. Other boat builders nurse visions of "going to Tahiti and chasing girls," he says. "They're between 60 to 70, and they still dream what they will do in the South Pacific, and their boats will never be finished." Though he has a gregarious manner, his social links are fewer by the year. Most of his friends and relatives are dead. "I had cellphone for two months, and I had to ask someone just to call me to see if it works," he says. "I see these other guys, and they're retired, and they have wives. They can't do what they want. I'm free." When he was married himself, to a woman 18 years his junior, he was able to devote just two hours to his boat on Sundays. She thought the boat stupid. The marriage lasted seven years. The tool shed beneath Markvart's boat is filled to the brim. He expects his 32-foot cutter to not only be his home once construction is finished, but also his final resting place. "If something happens on high seas, so what? It’s much better than to die in traffic accident, or under surgeon’s knife,” he said. "Once I leave this yard and get on water, I plan to stay on water. And if something happens on high seas, so what? It's much better than to die in traffic accident, or under surgeon's knife," he says. "If something happens like heart attack and boat is not finished, I don't need it anymore." He laughs. "It's easy to die for a man who has lot of things to do and has to do it on little money." He knows the solitude of the open water drives some people crazy, but he insists he won't be lonely out there where "you have just the water trembling." Adrift, he figures he'll do fine with the companionship of his movies and his medallion of St. Christopher, the saint of travelers, affixed to his life vest. He has a plan, should incurable illness come at sea. He has worked it out in his mind. He'll open the boat's through-hull valves and let the ocean in. "That will be my home," he says. "I can take it with me to the other world." His whole life, he's been planning escapes. His father was a prosperous Prague capitalist, which made his family a target of the postwar Communist government. In his teens, Markvart was captured trying to sneak into West Berlin and conscripted into the Czech Army. He fled again in 1967, this time taking the train in wide, looping patterns until he reached the border between Yugoslavia and Italy. He hid in the high grass, he says, and sneaked into Italy past border guards while they were distracted by their noon meal. A year later he was in the United States. His boat is crowded with VHS tapes, and among his favorites is "Night Crossing," the 1981 film about two East German families who secretly improvise a balloon to carry them to freedom across the Berlin Wall. He'll watch just about anything with a dramatic getaway in it. One year soon, he's going to make his own final jailbreak. The boat's name is already engraved on the hull: STARALASKA . In Czech, that translates as "old love." One of the many derelict boats at the lot where owners rent space. When boat builders pass on, their unfinished vessels are eventually hauled off to the junkyard to make room for more boats and more dreams. Manager Maria Chan says sailboats are overwhelmingly a male obsession, and from what she's seen, a frequent cause of divorce. "Either the husband has to give up the boat or has to give up the wife," she says. She remembers a man in his 80s who came regularly to visit his 50-foot sailboat but lacked the strength or the will to build out the bare hull. For years, she says, "he just sat on the boat dreaming and didn't do anything." A couple years ago, he died alone at home, and she had his boat hauled to the junkyard. Then, one morning last year, she opened up the boatyard to find another old boat builder stiff at his workstation, his TV running. He'd been dead a couple days, and no one had missed him. "All these loner people," she says. "No wife, no children." Markvart is in that category. She gives him a 50-50 chance of making the water. She's less optimistic about Larry Myers, an 81-year-old widower who drives from Anaheim every morning to work on his 44-foot ketch. He's hanging on heroically at a workstation not far from Markvart, taking his stand against time. He recently installed Burmese teak on the deck, strip by strip, despite a World War II mortar wound in the shoulder. Myers, who has seen enough of the globe to suit him — including North Africa and Italy during the war — is in no rush. "I hope I launch at 90. Better yet, I hope I launch at 95," says Myers, whose goals for the boat are modest. "This is gonna be a party boat. We'll go to Catalina Island and have coffee, cake and cookies." It's a gray day in late fall, and Myers is taking a cigarette break on the steps below his boat. Here comes Markvart, wandering over to say hello. Myers admires Markvart's craftsmanship but ribs him about his frugality. "If he can get something for nothing, he's happy," Myers likes to say. "If not, he wants to pay 99 cents for it." Before long, the two are musing about mortality. Maybe it's the color of the sky, or maybe death is the most logical subject for those who find themselves sharing a windy corner of its anteroom. "If you get old and you have some project to do every day, you live forever," Markvart says. "You want to know what the most fatal disease of all is?" Myers says. "The most fatal disease is life itself." This elicits one of Markvart's favorite stories, that of a workaholic couple he knew who wasted a lifetime grabbing money with both hands and then died — a heart attack for him, a stroke for her — without children. Myers feels Markvart hasn't exactly grasped his point, and clarifies: "Everybody dies, period." 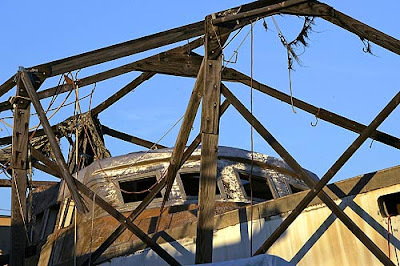 "Fatal diseases," replies Markvart, who is known to worry about toxic airborne substances, including fiberglass particles from other boat builders carried into his shed by the wind. He tries not to complain too loudly, because there are so few places for a man to build a boat, and doesn't want to stir up trouble. "Karl, I'm just saying you die," Myers continues. "It doesn't matter. You could be going down the freeway and get killed. And if you have to worry about dying, you may as well die." "I was very close to death the last time I went to Europe," Markvart says, describing how a box of flowers and soil nearly fell on him during a 2001 visit to Czechoslovakia. "I was just a half-second from certain death." "Hey, Karl, you want me to tell you how many close calls I've had in life? " Myers says, launching into the story of how a German mortar shell killed the soldier beside him in Italy. It's less a conversation than a duel of alternating monologues. For his part, Markvart invokes his own memories of the war, describing how an allied bombing raid nearly flattened his home in Prague. "The house next to us, there was nothing but crater," Markvart says. "I was 5 years old." Their exchange has exhausted itself. Myers walks carefully up the wobbly steps to his boat. Markvart walks back across the gravel to his own. As always, there's work to be done, steel scraps to measure and hack and press into perfect, shiny fittings. Markvart knows it's perilous to think too much about the day he's aiming for, when he finally lowers his boat into the Pacific. He knows it's smarter to focus on one task at a time. But when the day comes, Markvart doubts anybody will show up to see him off, because he hasn't spent a lifetime collecting friends, which is one of the reasons it will be easy to leave. He will not bother breaking a champagne bottle, since he thinks of the ritual as a rich man's theatrics, and he's not building the perfect boat only to risk chipping it pointlessly. He will just motor out of the harbor and into the open ocean. His final plot executed, his final escape launched, he will angle his sails and point his boat north. It won't be a dramatic sight, just a stooped, smiling old man with strong hands, and a little time left, giving himself over to a boy's picture and the wind. The sun sets on another day of boat building. “Once I leave this yard and get on water, I plan to stay on water," Markvart said.